This week Amy has hit the proverbial nail on the head – light, at least to a photographer, is magic. Especially when traveling, it can be difficult to choose the times during which we’ll be able to shoot, but we can always find a way to capitalize on the light that’s available. 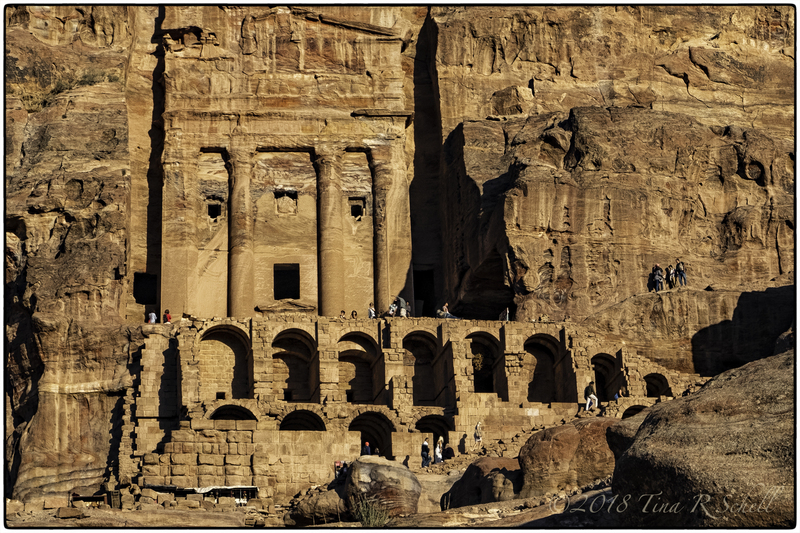 In my opening image of one of Petra’s amazing rock-carved masterpieces, I was able to capture the soft, late-day light just as the shadows were beginning to creep in. Note the tiny people in the image to get an idea of the structure’s massive size – which amazingly dates back to 400 BC. Tragically 11 people were killed when a massive flash flood hit Petra just 5 days after our visit. Thousands of tourists were evacuated and the site is temporarily closed for cleanup – timing, as always, is everything. 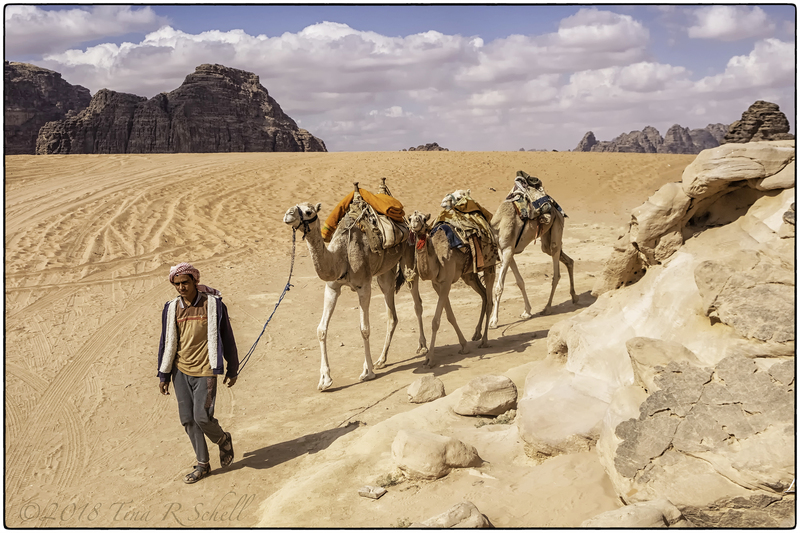 On the other hand, in the image above a bedouin camel-herder leads three of his charges in the mid-day sun of Wadi Rum. Notice the shadows of the subjects directly beneath them. In this case, although I’d have preferred softer light, I felt that the subjects carried enough of a message that I was willing to overlook the harsh mid-day conditions. Sometimes the story can be as important as the timing. In the image above, it was the mid-day sun passing through an awning – nearly the exact blue of the sky – that drew my attention. The dome in the background for me added an element of spirituality and mysticism. Perhaps the combination of the elements meant more to me having just learned the importance of the color blue to those who study Kabbalah. 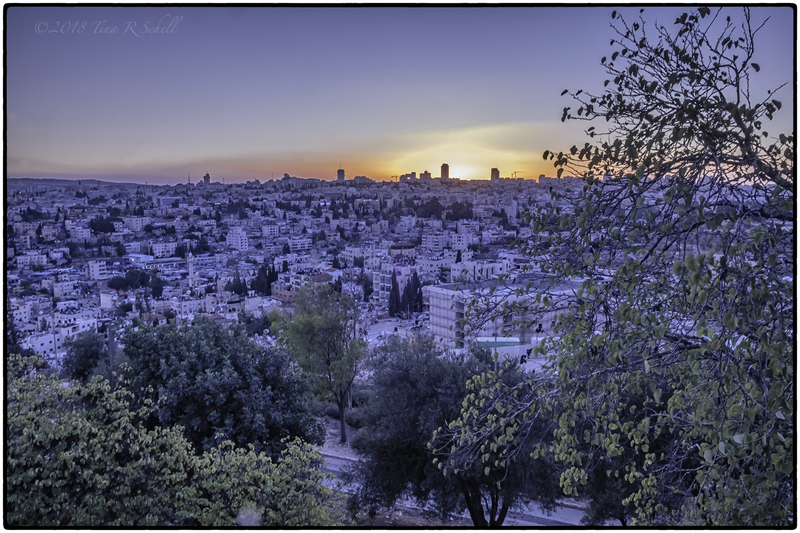 One of my favorite moments of our journey was our first view of Jerusalem, seen from high above as the sun made its final gasp before settling below the skyline. There is something quite magical about the city, perhaps driven by her perseverance despite the many times she has been destroyed throughout history. All of the major religions see her as a holy place, and archaeologists from around the world continue to explore the riches that lie beneath her walls. As visitors we cannot help but wonder at the stories she could tell. In Israel’s Negev Desert, night falls quickly and the cool light of blue hour is softened by the warm hues of the desert rock. Here, a massive crater was formed by the action of the sea rather than by volcano or meteor. Rocks at the crater’s bottom have been dated as old as 200 million years. 25 miles long and over 1600 feet deep, it is an amazing example of nature’s incredible power. Finally, I’ll close with a capture of sunrise over the Sea of Galilee. I was drawn to the scene in part because the moon still clung to its place in the sky despite a push from the sun to claim it. Having heard so many stories about Galilee growing up a Christian, I found it particularly meaningful and surprisingly beautiful. Thanks to Amy for giving us an opportunity to explore the many forms of light – which color our world and enrich our lives. Be sure to visit her original post here, and remember to tag any responding posts with the Lens-Artists tag. I love this whole post! Light is everything in photography. Lighting can make a moment feel and look different. Love all the photos and quotes! Thanks April, yes the Kabbalah session was really interesting. I had no idea! Thank you Sue, it would indeed have been right up your alley! Thanks for stopping by anyway! I somehow almost missed this stunning post Tina. What a magnificent display of light working its magic. The camel herder image spoke to me and, as you say, midday light is often too harsh, in this case it worked perfectly capturing the harshness and the beauty of a desert and how hard an existence living there must be. The vivid colors in this are just so amazing! I feel transported! Thanks Laura, glad to have you along for the journey! Hi special lady, it must have been amazing travelling this area and photographing its marvels. The sea of Galilee is my favourite capture and I would probably have echoed your sentiment “particularly meaningful and surprisingly beautiful”. But places like Petra is also amazing given the absence of technology. Glad you weren’t there 5 days later! By the way I hope you see my post in the reader as I don’t see it despite having un-followed and re-followed myself. Thanks Abrie, yes I think every moment of our journey was very special, including of course Petra. Magical is a good word for it. And yes, you are in the reader! These are so beautiful – the image from Petra is quite intriguing and beautiful!! Magical light indeed, Tina! Stunning images all with different types of light! Beautiful pictures, Tina! Your narratives make them richer, too. All these photos are terrific. I particularly like the one of the camels. It is so evocative. And… the shadows (mid day sun) in pic two are my fav (seemed like something a painter would add in) and then then the Sea of Galilee was special to me to – for the history connection but also that moon and the whole vibe! Thanks Yvette. Interesting comment re the shadows. Loved that thought! I took a brief ride on a camel in the Jordan desert. It wasn’t that it fulfilled a life long dream – it was just an experience I knew I would never get a chance to do again! Love the Edward Weston quote! A fortuitous post I would say… how lovely …. I do love traveling with you. Glad to have you along GF! 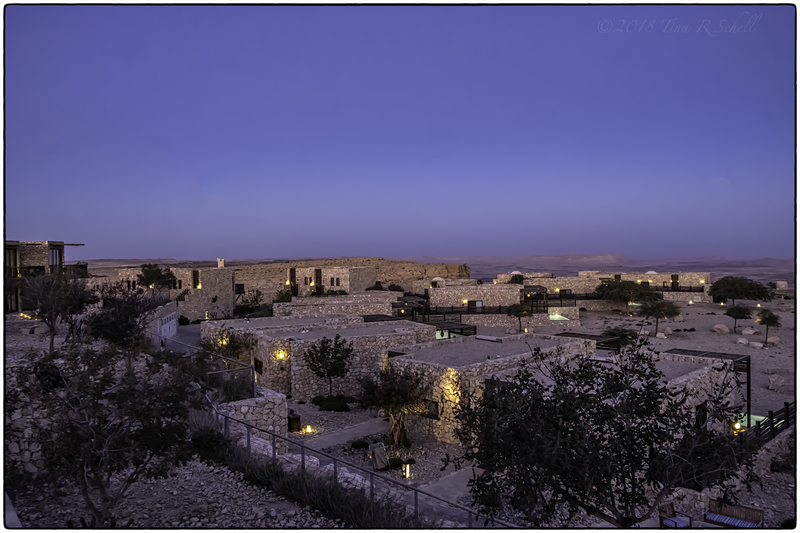 Your “EVENING LIGHT, MAKHTESH RAMON” photo is superb. You broke some rules by centering the horizon, and then took it to another level by using the walls and roof tops to eliminate a straight line by stepping down the horizon as it crosses the frame. And then you have the distant mountains and desert to come back across the horizon and straighten it out once more. POV is everything and your exposures are spot-on, Tina. This is a Chamber-of-Commerce photo. Thank you Allan! I worried the distant mts and desert were too subtle, appreciate your really giving this one such thought! It’s a winner, Tina. There is so much going on. BTW, The pools of water are beautiful highlights. I love that aqua color. Very nice Tina…a great shot of the camel herder. Thanks Andy – challenging to isolate the subjects on that one! All gorgeous and magical, Tina! And the extra feeling of magic – because it is Israel, Jerusalem and the Sea of Galilee. Wonderful journey. Thanks Ann-Christine. One thing for sure, the light there is amazing along with so much else! And you captured it with the right feeling. Thanks Toni – happy to have you along on our journey! What a journey you had/are having, Tina! Thanks for transporting me somewhere so beautiful and so appropriate for a Sunday. 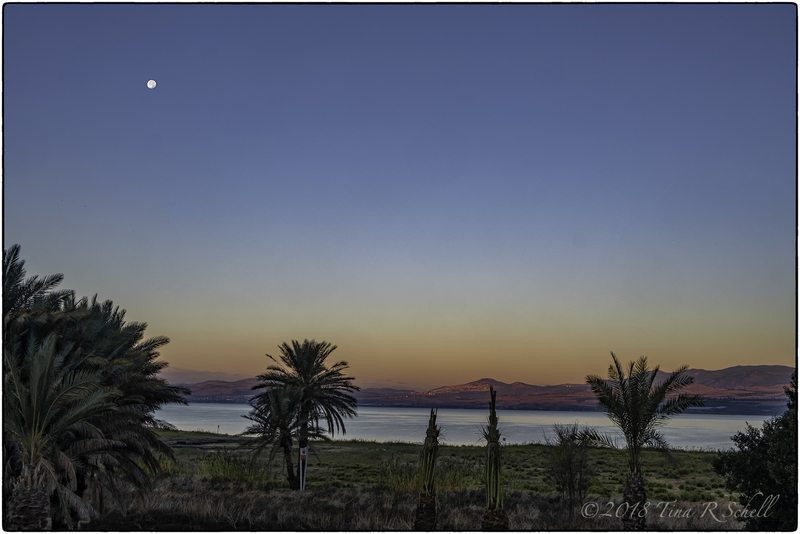 I love the last light over Jerusalem shot and the last one at the Sea of Galilee. Especially loved sunrise on the Galilee! Bravo, Tina! Love all of them! There is nothing better than desert light so sharp and clear. What wonderful shots! Thanks Carol, glad you enjoyed! And let there be light! Incredible shots, Tina. Your story behind the photos makes the pictures come to life. Glad you missed that flood. My family missed it as well. Sad news. Travel safe. Thanks Perpetua, for your lovely compliment. Yes the flood is just awful, we were very fortunate to have missed it. Spectacular photos, Tina, and beautiful thoughts on the importance of light! Wow, Tina. Your photos are as gorgeous as I’d imagined they would be. The light here is amazing. I love the “Bible Society” sign in your capture of the blue awning. How perfect is that! Welcome home, too. Many thanks Patti- I truly enjoyed the many wonderful photography opportunities in both Israel and Jordan. It’s very special how much a love of photography enhances travel and vice versa, isn’t it?! Absolutely, true, Tina. Photography really enhances the entire experience and frames it too. Thanks so much Xenia – must admit I truly enjoyed this week’s challenge! Beautiful photos and great quotes. I felt I took some of my best photos ever in Israel and Jordan, and i realized eventually that the soft light there, reflected in ancient stone and sand, gave me quite a boost! You are an amazing photographer in any light, but these are spectacular portrayals of the special hues in that part of the world. I agree 100% about the light there Lex. And both countries were amazing. You know what they say – to take better photos visit more interesting places LOL. Thanks so much for the beautiful compliment. Wonderful images, Tina. Your lead photo of Petra is gorgeous as is the view of Jerusalem. How classic to see the camel herder. Looks like an amazing trip. A relief you left before the floods! Thanks Jane, it was an amazing journey – especially considering both countries are quite small. The flash flooding is a very frightening aspect of their geology. There were 21 kids killed in a similar flood in Israel while we were there. Fortunately we had only glorious weather during our visit. I must admit I cannot imagine the thrill of visiting Jerusalem. The photo of the sunrise over the Sea of Gailiee reaches out and touches my soul. Fantastic images and commentary, Tina. Perfect for the challenge! All great examples of the theme, well done. I love your narration with the photos – telling us what you were thinking, and then showing it in real photo time, is very powerful. Thanks Shelley. I sometimes wonder how many readers actually take the time to read LOL. Much appreciated! Spectacular photos, what a journey you’ve taken me on this morning. Thank you! So happy to have had you along SueBee and Kat! Thanks for joining me. Thanks Wanderessence. Yes, I agree, both Israel and Jordan have lovely light, enhanced by the amazing sights, especially in the antiquities. Gorgeous photos of a magical place, Tina! Thanks Susan. It is magical indeed! A beautiful magical light post, Tina! I especially love the capture of the first view of Jerusalem. 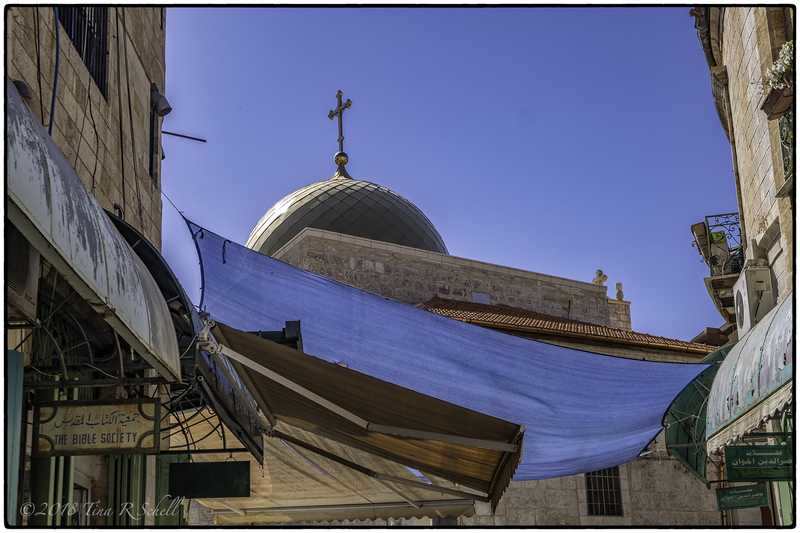 The light of the Holy Land is extraordinary via your lens. Thank you for this special tour. Thanks so much Marcus. I know they are closed for cleanup but don’t think they suffered major long-term damage thankfully. And a great Sunday to you too. Your photos are magnificent as usual, and I’m glad you left Petra before the flash floods! Thanks so much Hien, yes we were shocked to see what happened after we left. So sad.